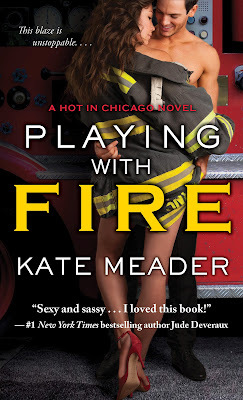 We are excited to be on the blog tour for Playing with Fire by Kate Meader. Please note that each participating blog will do a FireGiveaway: one copy each of Flirting with Fire and Baby, It’s Cold Outside (which includes Rekindle the Flame, the prequel e-novella which will publish 11/30/15 for $1.99!) You can visit all sites on the blog tour to enter the Fire Giveaways – but keep in mind you can only win once! U.S. only.